To wind the tassel: Tape thread ends from three gold spools to a 5" (12.7 cm) square of cardboard. 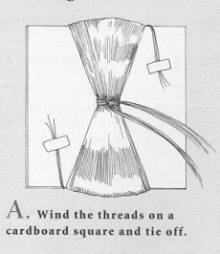 Contain spools in small box or bag, then hold three threads together and wind them around cardboard 300 times. Tape free ends and clip from spools. Thread tapestry needle with six 14"-long (35.6 cm) strands of the gold thread. Slip needle between cardboard and wrapped threads at middle and pull stands through halfway. Repeat to make double wrap at middle of square. Pull ends snug, and tie square knot (see Illustration A). On reverse side, clip across threads at middle to release hank from cardboard. 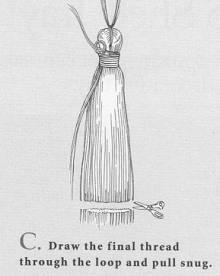 To bind tassel neck: Hold three gold threads together; do not clip from spools. Make small loop 7" (17.8 cm) from end and press against top of hank. Begin winding spool thread around hank, trapping loop as you go (see Illustration B). Continue winding snugly for 1/4" (0.6 cm). To end off, clip threads from spools and draw loose ends through loop. Pull gently but firmly at both ends until loop disappears down into neck of tassel. Press using a cool, dry iron (rayon setting). 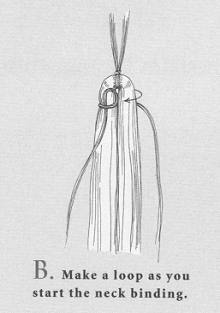 Trim tassel threads evenly across bottom (see Illustration C). 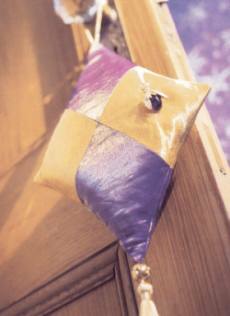 Using pattern, cut four diamonds from each of the following fabrics: lilac silk, mustard silk, purple organza, and gold organza. 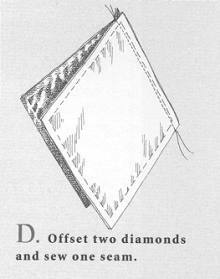 Place an organza diamond on similarly-colored silk diamond; hand-baste 1/4" (0.6 cm) from raw edges around entire diamond. E). Repeat to sew a second pair. 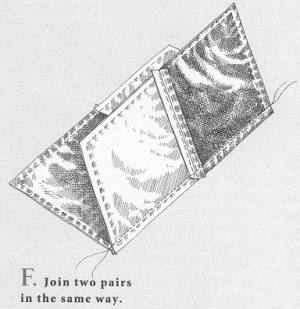 To join two pairs, lay one pair flat, right side up. Lay second pair on top, right side down, and match edges so purple fabric is visible at each end and seams align; stitch 3/8" (1.0 cm) from edge (see Illustration F). 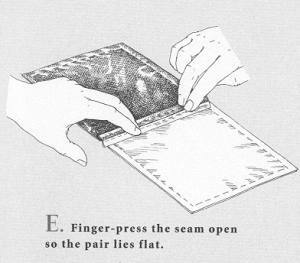 Finger-press long seam opening (see Illustration G). Repeat process to make second diamond. 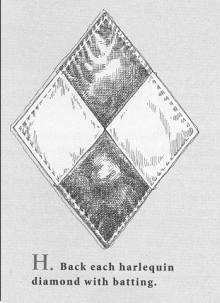 Using harlequin diamond as a template, cut two diamonds from cotton batting. 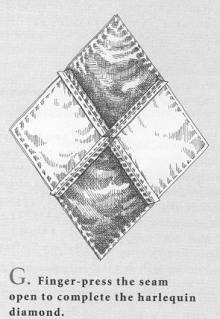 Line each harlequin diamond with batting and baste around all edges (see Illustration H). Cut a 14" (35.6 cm) length of gold cord. Flatten cord ends and baste to upper point of harlequin diamond. Stack harlequin diamonds right sides together, matching edges and seams, and with cord sandwiched inside. 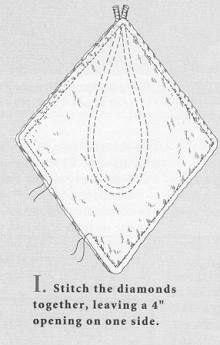 Machine-stitch 3/8" (1.0 cm) from edge around diamond, leaving a 4" (10.2 cm) opening on one side (see Illustration I). Trim seam allowances to 1/8" (0.3 cm) but do not trim opening; clip corners. Turn right side out, and push out points. Using embroidery needle, draw three tassel head threads through filigree bead and into lower point of harlequin diamond. Repeat with remaining three threads. Knot ends together on inside of sachet. Fill cavity with dried chamomile and lavender. Slipstitch opening closed. 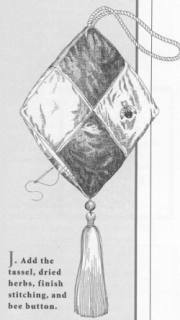 Sew bee button to gold diamond (see Illustration J).